As another hindrance to education let us note that playing the flute renders the flautist incapable of speaking. Athena, we remember, invented the flute and then cast it aside because she didn't like the way playing this instrument distorted her face. "Platonists" today who say the same about Heavy Metal music). Aristotle agreed with his teacher in principle, but allowed the flute into his Ideal State, where it would be played only at such occasions "where listening aims more at cleansing than instructing". 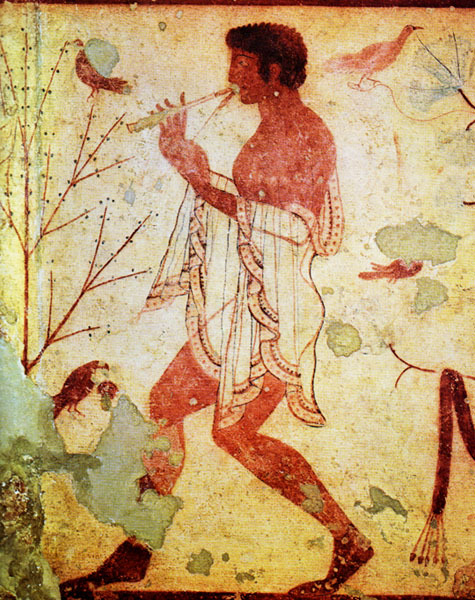 And what did the Etruscans have to do with the flute? It was some time around the tenth century ВС when this people emigrated from Turkey to Italy. There they established the first western European cities in the land to which they gave their name, Tuscany, and to which they brought Greek music and culture. 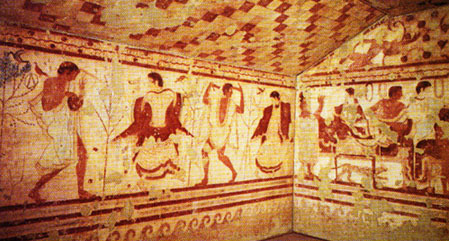 Yet the Etruscan achievement is most convincingly attested to by their tombs, some of which are in superb condition. They are not only Europe's first domed buildings, but also contain its oldest frescoes. Flute Players is a superb example of works that were discovered in 1830 in a beautifully decorated tomb in Tarquinia, one of the largest Etruscan cities, situated about eighty kilometres north of Rome.